← Pentecost – Acts 2 – "The Day of Pentecost"
On Trinity Sunday, we’re directed to jump into the deep end of the doctrinal pool where we are reminded that God is higher and deeper and wider than all the little boxes we try to fit Him into – our own brain being one of the smallest. So maybe the first thing to say about Trinity Sunday is simply that IT IS GOOD FOR US. And we should probably recite the Athanasian Creed more often than annually. So how about if we start with quarterly. And maybe if we start swimming in the deep water more often we’ll get more comfortable in it – and probably become more discerning about the one, true God and all of the phony imitations. And we’ll probably become better witnesses to the one, true God too. The temptation that the preacher faces on Trinity Sunday is to try to EXPLAIN the Trinity, as if he has discovered the secret formula for making what the church for over 1,500 years has said was ‘incomprehensible. ’ Rather than trying to solve the ‘mystery,’ I think the best thing to do is to LEAVE THE ‘MYSTERY’ A ‘MYSTERY’ and simply invite you all to jump in and drown in it. Because really, that’s exactly what you have already done in your baptism. You were not baptized into a ‘Unitarian god,’ but into the Trinitarian God. “I baptize you in the name of the Father and of the Son and of the Holy Spirit.” Whether you were sprinkled or dunked, you’ll never enter into deeper waters than the waters of your baptism where you were swallowed up into THE MYSTERY OF THE TRINITY. And so even though it really is good for us to want to explore the depths and the heights and the width of this mystery that we have been swallowed up into – we do so knowing that we’re always going to end up on our knees “in fear and trembling,” confessing that the one, true God is so much bigger than we are – and thanks be to God for that. But the truth is, God wants us know Him – not simply as ‘incomprehensible mystery’ to be feared, but as the God who ‘became like us’ so that we might know Him ‘personally,’ as a ‘friend knows a friend,’ as child knows his father, as a wife knows her husband, as lost and condemned sinner might know her Savior. If nothing else then, on Trinity Sunday we are deeply humbled to be reminded of just how far this one, true God has ‘humbled Himself’ to REVEAL HIMSELF to us. Within the Trinity, in which “the whole three persons are coeternal together and coequal,” it is through the 2nd Person, the Person of the Son, that the Triune God reveals Himself to us – and in no other way. Luther is so helpful here because he refuses to get all caught up in all the philosophical speculations about who God is. He wants no part of what he calls, “THE HIDDEN GOD,” but only the “REVEALED GOD” – the God who is born of the virgin Mary, crucified on the cross, resurrected on the 3rd day. This is the one, true God who takes on our flesh and bones and humanity SO THAT we might know Him. •	The Son of God speaks to us in HUMAN LANGUAGE SO THAT we may ‘hear’ Him, and Him, know that we are hearing God speaking to us. •	The Son of God “humbles himself” and “becomes like us” in every way except for our sin, so that in seeing Him suffering and die on the cross, we might know God Himself has suffered and died FOR US and IN OUR PLACE. •	The Son of God comes to us, not with philosophical principles or symbolic illustrations – but profoundly in the simplicity of bread and wine, SO THAT as we do the very human and ordinary thing of eating and drinking, so that we may know that He is both spiritually and bodily present with us – forgiving our sins and strengthening our faith. So, we take this doctrine of the Trinity seriously only because we take Jesus seriously. He is the One who said, “No one comes to the Father except through Me.” He is the One who reveals the Father and who sends the Holy Spirit. Only in knowing Jesus Christ do we know anything about the Father who sent His only son into this world. It is only in fixing your eyes on Jesus Christ and Him crucified and risen from the dead that we know something of the depth of the Father’s love for the whole world and His longing that ALL WOULD believe and be saved and that NONE WOULD perish. Which is to say that you’ll never get the Trinity right unless you get the Son right. And you’ll never get the Son right unless you get the Trinity right. And once again, we’re all caught up in the mystery. And there’s no better place to be caught up. Riddles and equations are meant to be solved. And once you solve them, you’ve mastered them. Surprises are meant to be discovered. And once you do, they no longer surprise. But mysteries are not like that. 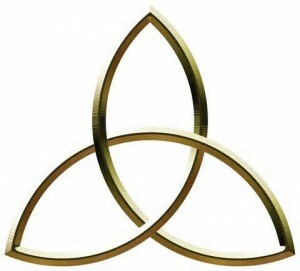 The more you comprehend the ‘mystery of the Trinity’ the more you realize how little you comprehend. Throughout the history of human race, men and women, in their striving to be “LIKE GOD” have struggled to be content with ‘living in the mystery.’ They want to ‘solve’ it and in ‘solving it,’ prove to themselves that man is not as ‘small’ as were told we are, and God is not so big that we can’t ‘master’ Him. There are three boundary lines in particular that Athanasian Creed wants to mark as clearly as possible SO THAT we STAY WITHIN the boundaries where we're safe; so that we may DEFEND the one true faith against all the false gods we have created; and so that we properly BEAR WITNESS to the One, True God, apart from whom, no one is saved. The first boundary line is this: however we talk about God, we are not to talk about God as if there were three Gods. Any talk of God as more than One crosses the boundary and should set off alarms. So, when you hear talk about the forces of good and evil, the 'ying and yang' that hold the world together, let the alarms sound. When you hear talk about lots of gods, you've got yours, I've got mine and they’re all the same… run away and lock the doors. And in the same breath, neither can we divide the persons of the Trinity so that they neatly add up to ONE. The Father is not 1/3 God, the Son 1/3 God, the Spirit 1/3 God. Each person is fully God, and the Father is not the Son and the Son is not the Spirit and the Spirit is not the Father. And there is only One God. The third boundary that dare not be crossed has to do with the way that we talk about the 2nd person of the Trinity in particular. However we talk about the 2nd Person, we are not to talk as though He were God OR man. He is fully God AND fully man. Here's where we get to the cross and resurrection, which all true 'God-talk' always has to get to. The question is, who was crucified and died on the cross? Who was buried in a tomb and raised from the dead and ascended into heaven? Was it man? Or was it God? And the answer is BOTH. When Jesus died on the cross, God died for you because the Son is fully God. It wasn’t just His humanity that died – “for although he is God and man, yet he is not two but one Christ.” What God has joined together in Jesus, He does not rend asunder – even by the cross.